Board meetings are a fact of nonprofit life. Why not show them a little love? We all know the feeling: the essential but sometimes routine business that makes up the board meeting agenda can sap board members' energy. Before you know it, board members are looking at their watches, thinking about their next meal and planning their great escape. This doesn't have to happen! Break the tragic cycle of board meeting monotony with these five ideas. 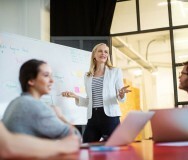 Encourage your board to connect the work they do with the organization's mission. Your mission is at the heart of what staff and executive leaders do every day, but it's easy for board members, who may have only occasional contact with the organization, to lose sight of it. In the case of one of my clients, the board recited the mission statement at the opening of each board meeting. While this came naturally for this group, it might feel contrived to others. I often suggest including the mission at the top of board meeting agendas as a way to remind the board why they are there. Another option is to post your mission statement on the wall in the room where the board meets. Ask someone who has been through your program to offer a special take on the work you do and the impact it has. A "program alum" can provide a powerful description of life before and after your organization provided needed assistance. Showcase actors or dancers (for performing arts organizations) to talk about what it means to be affiliated with your organization and the distinguishing characteristics that separate you from the others. Feature your staff. Ask program directors to tell stories that bring to life the work you do. Think, too, about creative ways to bring these guests into the boardroom. Perhaps a brief video of the first read through of your next production would be invigorating for an arts organization board. For a human services or educational organization, consider a video of children participating in your programs. Does your board meeting agenda feel stale? Is looking at the date at the top the only way to differentiate one month from another? Do you feel like there is never enough time to address new business or have strategic or generative conversations? Reconfigure the agenda to ensure that the substantive conversations happen at the beginning of the meeting rather than at the end when board members are tired and ready to be on their way. 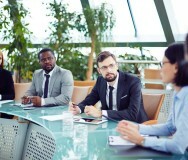 There is no rule that says you have to begin with committee reports (which should be distributed and read prior to the meeting anyway) and have new business discussions be the only thing between board members and the door — or, worse yet, not happen at all because the more commonplace business ran overtime. Another way to shake things up is to ask board members to change where they sit. If you sit in the same place all the time, with the same people next to you and across from you, creativity may be dulled. Not to mention that you don't talk to new people and gain new insights. Ask board members to move around and get a new perspective on the room, on each other, on the issues. If there is tension between board members, sometimes breaking their eye contact can mitigate it. Try having them sit on the same side of the table, not next to each other, so that they are unable to face off. Budget permitting, bring in outside speakers with skills to share with your board — for instance, speakers who can demystify evaluation or increase comfort with fundraising. For many years now, Chicago has been sponsoring "One Book, One Chicago." You can do something similar. Find a book, chapter or article with something to say that is meaningful to your organization and/or board. Buy it for the board and give it as a gift. Devise a plan for discussing it at one meeting or over the course of a few meetings. Ask board members to sign up to present on different topics of importance to your organization and lead a discussion. This is a great way to enhance leadership development and encourage board members to step up. Is an executive transition in your organization's future? Try the Annie E. Casey Foundation monograph Capturing the Power of Leadership Change. Don't let your board members get "hangry"
Does your board meet at a time that could be construed as a mealtime? Do you offer any sustenance? After a long day at their own workplace, hungry board members have only one thing on their minds — when do we eat? Don't let them get "hangry" (hungry and angry) because they can't figure out why you don't serve any food. Discussion and decision making all go more smoothly when stomachs aren't growling. The social time that accompanies breaking bread together also encourages relationships among board members and increases their trust in one another. These are just a few of the ideas that my client organizations have used successfully over the years to make board meetings more productive, engaging and even inspiring. Board meetings are a fact of nonprofit life. Why not show them a little love?